LightVR is an experiment on creativity and functionality in VR, with a vision to be a virtual room simulator. This allows anyone to create the room of their dreams, with pre-made props and “technology posters” allowing users to decorate their rooms to their liking. For example, LightVR users could build a cozy and intimate environment, an enchanted forest, or a futuristic spaceship-style room. Part of a dream room is allowing infinite TVs and monitors, which is supported through LightVR’s functionality allowing users to create as many web apps as they like, whether that means watching YouTube videos and playing a video game or Skyping with friends. MyDream has pioneered the concept of enabling the forward-facing camera on the VR headset for users to see their keyboard, grab a drink off the desk, or engage with people around them without the need to remove the VR headset. The camera is blended with the virtual world and is activated based on a set of configurable gestures, such as the user looking down at the keyboard. This “blended reality” allows for ease of typing and maintaining awareness of the physical world. The product is geared towards everyone from the casual VR user to those who want a fully-immersive VR experience with their headset on throughout. LightVR offers quality graphics which are realistically lit by the screen, and props which personalize the VR space. Window orientation, backgrounds, and additional features can also be customized and automatically saved so when you exit and restart the application, it restores the same VR state. - You must use the current version of the Oculus Home software. Older runtime versions like 0.8 are not supported. - Enable Unknown Sources in the Oculus Store by opening the Oculus Home Settings menu, navigating to the General tab, and toggling on "Unknown Sources" at the top of the list. 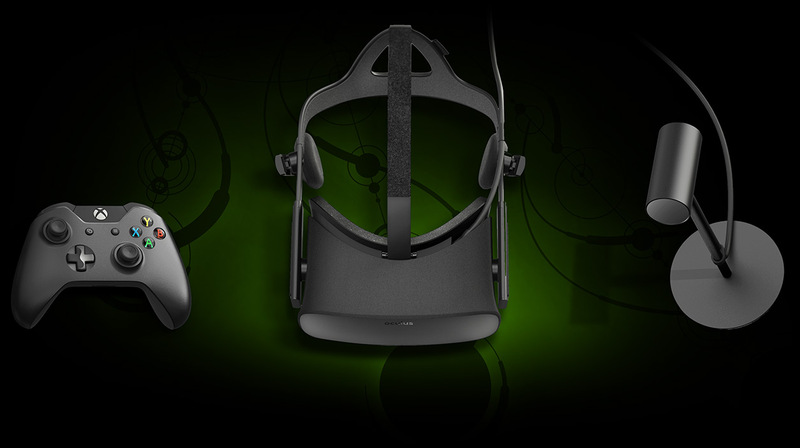 - Make sure SteamVR is turned off to maintain optimal performance and to avoid conflicts with Steam Desktop Theater. 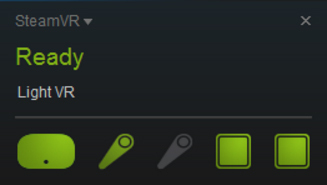 - Enable SteamVR in the Steam desktop client. - Disable Steam Desktop Theater as it conflicts with Swift. 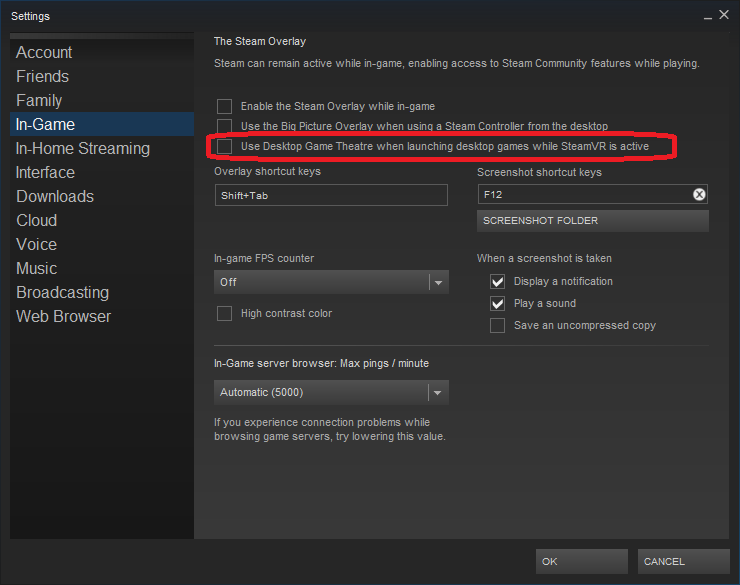 In Steam, go to Steam settings and uncheck the Desktop Theater box in "The Steam Overlay" section. - Make sure the main devices are green lit and are running and recognized. 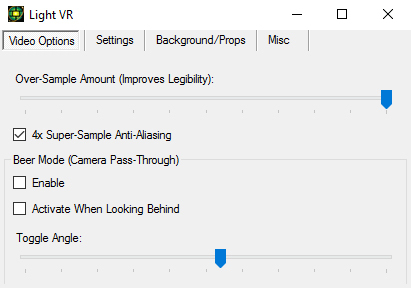 The Vive camera must be enabled for Camera Pass-Through to work, which is done by opening the Settings in SteamVR, then accessing the Camera tab and adjusting the settings to Enable Camera and Allow Camera for Room View. On some systems, the refresh rate needs to be reduced for proper operation. Sometimes the Vive camera hangs, which requires rebooting the headset to fix. 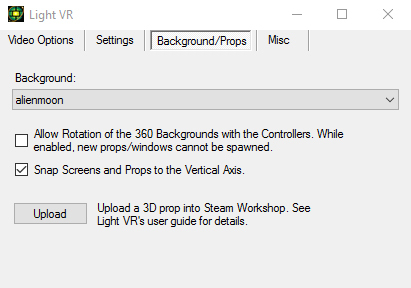 To do this, right click on the green HMD icon in SteamVR and then click on Reboot. If this does not fix the issue, close SteamVR, unplug the USB cable connected to the Link Box from the computer, then plug it back into the computer and start SteamVR again. This section covers the general operation of LightVR. There are a few main components to LightVR use and operation. 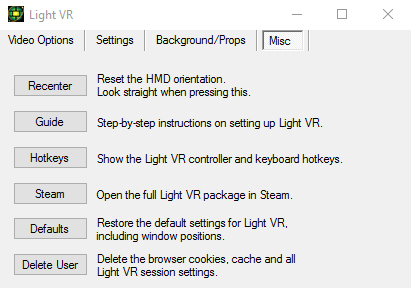 First is the LightVR Global Settings window, which controls many of the functions and settings for LightVR. It looks like this, and should be located on one of your Desktop screens. The second is the LightVR environment itself. The background can either be set to blank, or can have a skybox image used to ground the user and provide them with the context of an environment. Aside from the background, everything you see in LightVR is an object - desktop screens, browser screens, webcam screen, and all of the decorative props, are virtual objects that can be positioned, rotated, and scaled to your liking. The third is the Virtual Controller, which is a virtual representation of your real-world motion controller. The ray pointing from the controller shows where it is aiming, which is used to target objects to manipulate them, or to interface with the desktop and browser screens with mouse-like inputs. 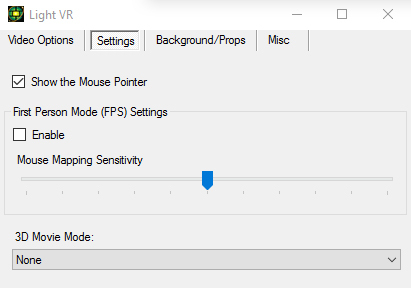 Left Click and Right Click are accessed by pushing in the Left and Right sides of the Vive controller touchpad, or the ABXY buttons on the Oculus Touch. - Aiming around the environment moves the position. - Twisting the controller Left and Right changes the clockwise rotation. - Swipe the Vive touchpad up and down or tilt the Touch analog stick forward and back to adjust the distance. - Swipe the Vive touchpad left and right or tilt the Touch analog stick left and right to adjust the horizontal rotation. 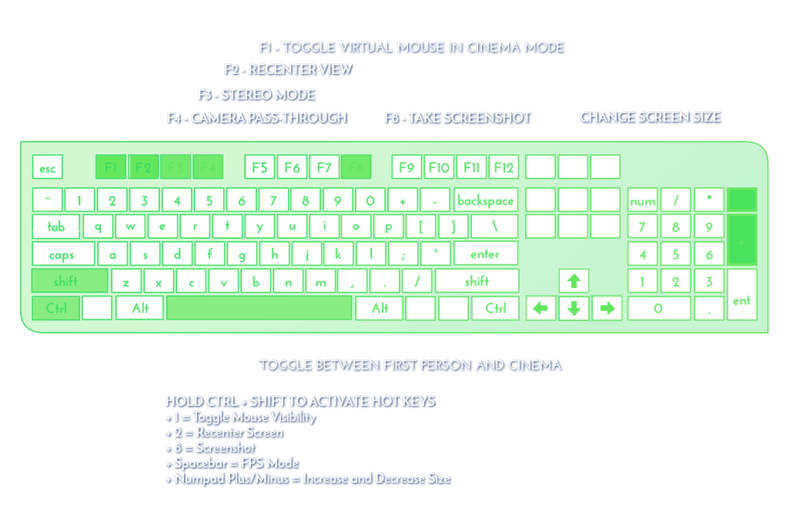 - Press in the Vive touchpad towards the top or bottom or ABXY buttons to increase or decrease the scale. - Aiming Up and Down adjusts the top-bottom rotation. - Aiming Left and Right changes the horizontal rotation. Aim at an object and press the Menu button or push in the Analog stick to open the menu. For Screens and Browsers, the menu appears on the screen itself, and is closed the same way it is opened. For all other objects, a radial menu appears, offering a variety of features:Locked toggles the ability to manipulate the object.Link allows the object to be positionally tethered to another object so they move together.Alt Skin cycles through available skins and textures for the object.Duplicate creates a copy of the prop with the exact same properties. Delete removes the prop from the environment. This menu appears around the controllers, so you will either need to look down at the controller to access it, or you will need to bring the controller up to your line of sight. Open the Radial menu, then access the Screens option at the top using the touchpad or analog stick. For an additional 1920x1200 Chromium-based Browser screen, select the Browser icon, aim in space, and press the Trigger button to place it. You may add as many of these as you want. For an additional webcam screen, use the Webcam icon, aim in space, and press the Trigger button to place it. 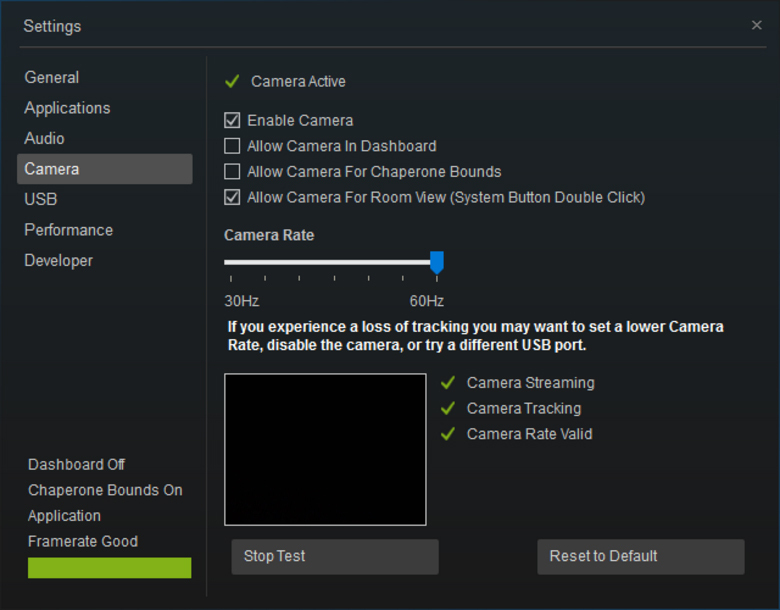 To change the webcam input source, aim at the screen, press the menu button or push in the analog stick, select Advanced, and select “Choose Webcam Source” to cycle through attached webcam devices. Open the Radial menu, then access the Props option on the right using the touchpad or analog stick. Props are divided into various categories for easier navigation. After a category has been selected, props will appear in on the ring selector surrounding the controller. Swipe or move the analog stick left and right to select different props on the ring selector, then aim and press the trigger to place them in the environment. Open the Radial menu, then access the Options option on the left using the touchpad or analog stick. Additionally, the menu can be used to take a screenshot of the scene, and to recenter the scene to the horizontal orientation of the headset. - obj file with normals, tangents and bitangents. Regarding size, the screen is about 5 units, so scale props according to that. Support for adding new background is coming later on!